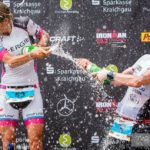 Astrid, you managed to transform from beginner to win an Ironman in just 4 years. What does this mean for you? It is incredible. In the beginning I just wanted to finish one long distance. Since then it had taken on itself. I just enjoyed triathlon so much, training and racing. I will never forget my first finish in Roth or the overwhelming feeling of happiness the first time I crossed the finish line in Kona. The victories in Sweden and Barcelona were the jewel in the crown and that motivated me even more to get to the start line in Kona with a lot of fire to race the stellar pro field. Triathlon is an important part of my life, I can prove myself and I discover a lot of good new parts of myself. Does your experience help you with coaching? Definitely YES. I just know all the situations you could be in as an athlete and know exactly how you feel. All ups and downs, from victory and success to injuries and defeat. I have been through it myself. Together with Chris, I always managed to eliminate all obstacles and change them into success. That is what I do with my athletes. Collect triumphs and living dreams. What did motivate you to live your dreams and how are you taking this message to your athletes? I learn from others. Beside from Chris there have been some books, especially biographies which touched my heart. 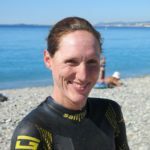 In the beginning it was Chrissie Wellington when she set the world record time in Roth and then it was her book „A life without limits“. I still admire her and her story still inspires me. She was the reason I signed up for Roth without having any experience in triathlon or cycling at all. 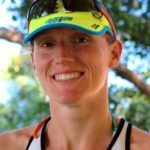 Meeting her in person in Kona 2013 leading into the race was such an inspiring moment and might have helped me to win my age group. Another book is „How bad do you want it“ from Matt Fitzgerald, it helped me to go to my limits and giving everything I can. The experiences from other people help me to have my own ideas and visions and to follow them. It is an ongoing process which I also go and live with my athletes. You learn from others, adopt and become successful yourself. Speaking of learning, I am currently continuing my training as a sports physician and the nutritionist will follow. Just as I’m burning for my sport, I’m burning to help others with the best and most up-to-date knowledge. How does it fit together, being a coach and going for big goals yourself? Well, it is not always easy. Our philosophy is to give the athlete the entire attention. For me this is only possible for a handful of athletes, so I can be there for my athletes and can still follow my goals and dreams. When I do something I do it 100% or even more – my coach sometimes gets desperate about this. Whoever works with me gets the best and will be in the focus of interest, so we can 100% follow his or her dreams. That is what makes me happy: Making other people happy and help them follow their dreams.